The smell of warm cinnamon is divine. 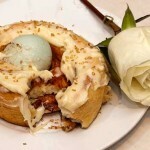 Wrap it with a buttery yeast dough and top it with a cream cheese frosting and you are in heaven. No wonder the famous Cinnabon is a hit at practically every mall in America. 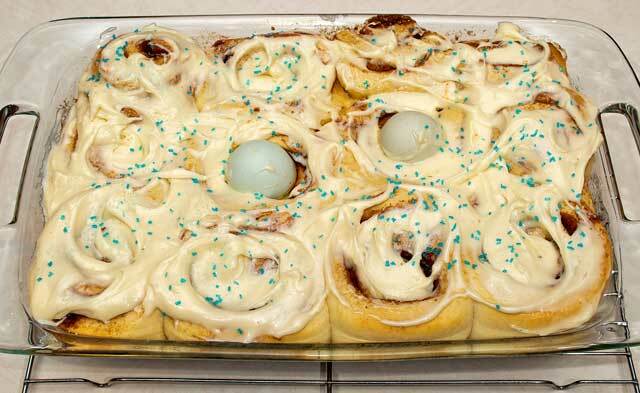 Judith Fertig’s cookbook entitled “I Love Cinnamon Rolls” reminded me how much I love these buns. With Easter just around the corner, I remembered the bread with hard boiled eggs that was served at the Easter Sunrise Service. 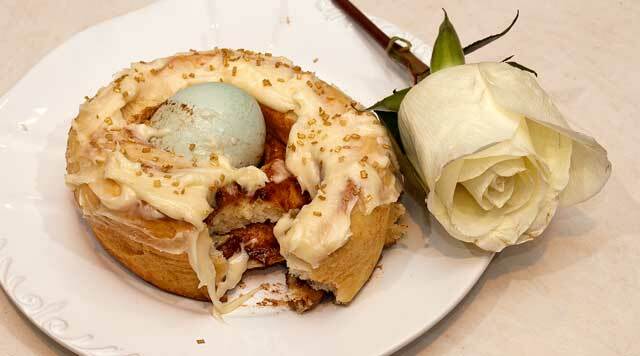 I thought why not put a hard- boiled egg in a cinnamon bun. So here is my experiment. A lot of people fear making homemade yeast dough. 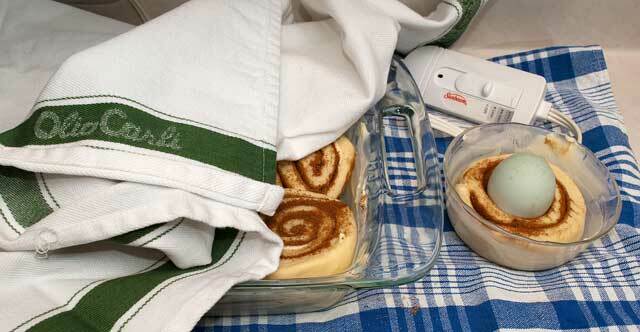 The following recipe, featured in Southern Living magazine, takes the fear out of dough prep. It is easy and the dough rises in the refrigerator. Over high heat, bring (1) cup of water and ½ cup of butter to a boil in a small saucepan. 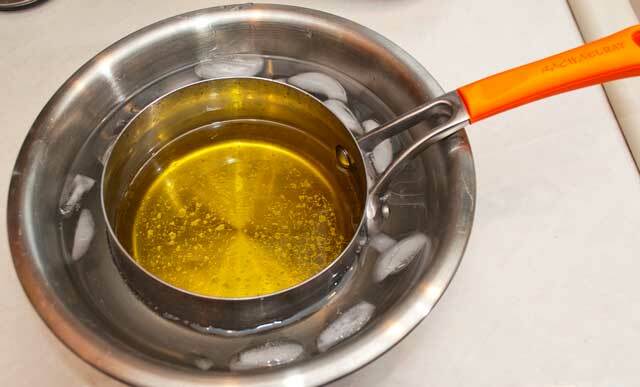 When the butter is melted, remove from the heat and let the mixture cool completely. If you need to speed up the cooling process, place the pan in an ice water bath. Stir together the yeast, warm water (100 to 110 degrees) and sugar in a small bowl. Let stand for 5 minutes. 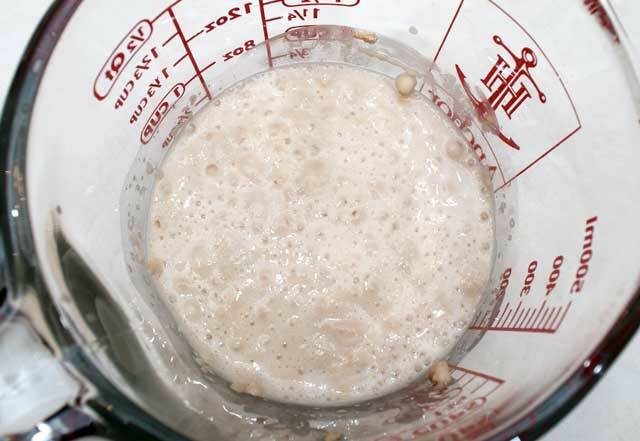 The yeast will bubble up if it is still alive (known as proofing). Beat eggs, at medium speed, using a stand mixer. Beat in, on low, ½ cup of sugar and the salt. Add in the shortening mixture and the yeast mixture. Reduce the speed to low, then gradually add in the flour, beating until well incorporated. NOTE: Schuyler, my sheltie, is looking on hoping something delicious falls on the floor. Put the dough in a lightly greased bowl. Cover and chill for 12 hours in the refrigerator. 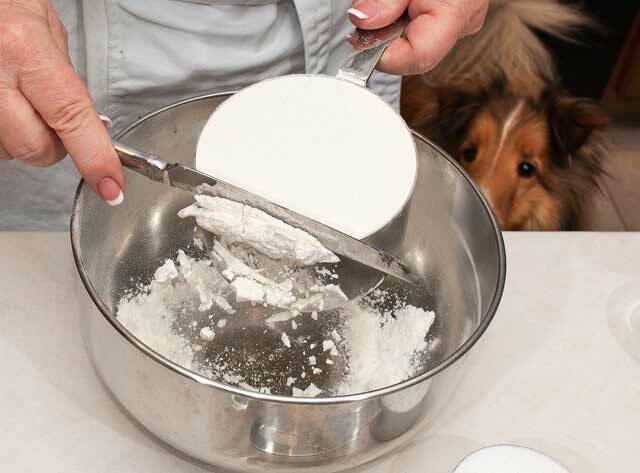 Then, transfer the dough to a lightly floured surface and roll out to a 16 x 20 inch rectangle. For the filling, mix together the light brown sugar and the cinnamon. Spread the softened butter over the rolled out dough. 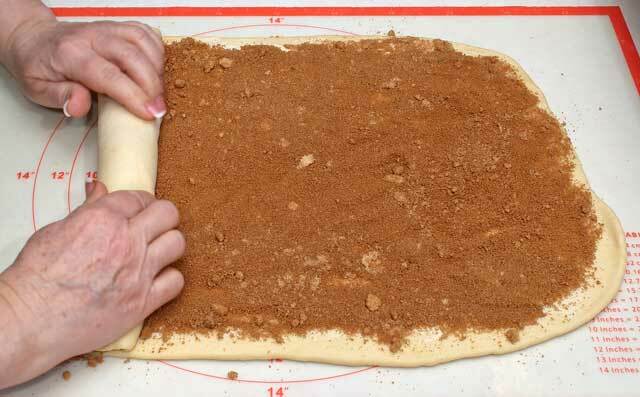 Then sprinkle the cinnamon sugar mixture over the dough. 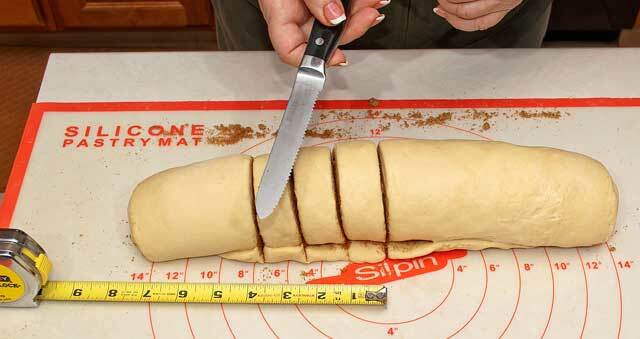 Starting with the shorter side, roll up the dough to form a tight cylinder. Cut the cylinder into 12 pieces. Use a serrated knife so that you don’t compress the dough too much. Place the 12 pieces in a buttered 9 x 13 inch pan, spiral side up. For individual buns, place one piece of dough in a buttered 8 oz. Pyrex glass dish. Separate the center of the spiral and insert a hard- boiled egg where desired. Cover the pan with a towel and let rise in a warm place until doubled, about 60 minutes. NOTE: You can use a heating pad to provide warmth. Turn it on medium, place a tea towel over the pad, and place the pan on top of the towel. Cover the pan with another tea towel. Let the dough rise. Preheat the oven to 350 degrees. Bake the 9 x 13” pan for about 20 minutes or until lightly browned on top. NOTE: I discovered that the buns that have the egg in the middle cook slower than the others. I covered the pan, after 20 minutes with foil and baked an additional 5 minutes. The individual dishes baked for 20 minutes and were perfectly done. 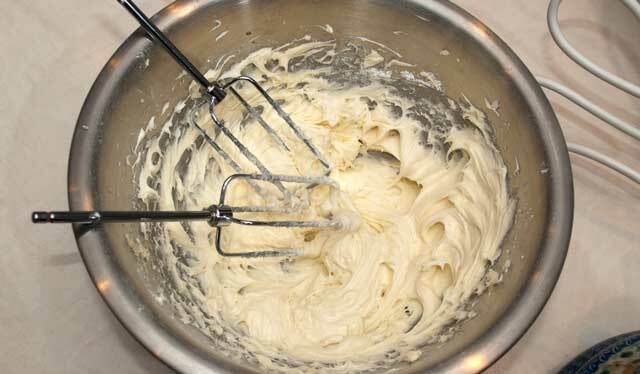 Beat the frosting ingredients together in a bowl. Spread over the rolls while they are still warm. 1 envelope active dry yeast 1/4 ounce pkg. Over high heat, bring (1) cup of water and ½ cup of shortening to a boil in a small saucepan. When the shortening is melted, remove from the heat and let the mixture cool completely. If you need to speed up the cooling process, place the pan in an ice water bath. 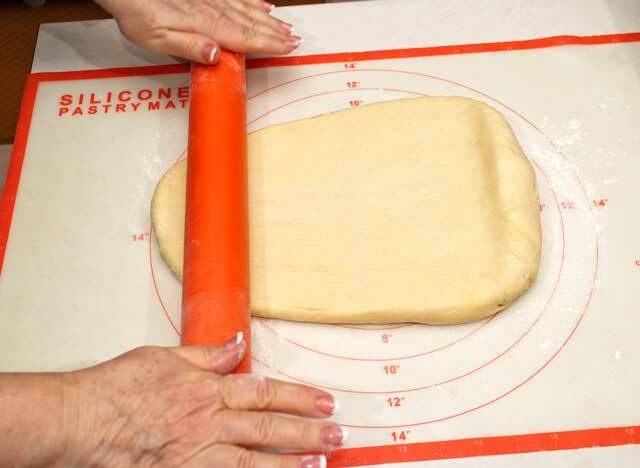 Starting with the shorter side, roll up the dough to form a tight cylinder. Cut the cylinder into 12 pieces. Place the 12 pieces in a buttered 9 x 13 inch pan, spiral side up. 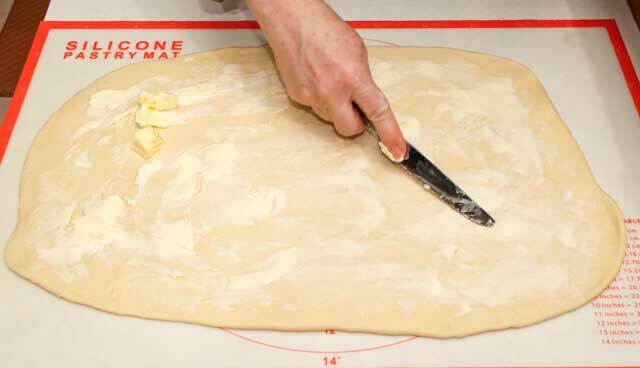 For individual buns, place one piece of dough in a buttered 8 oz. Pyrex glass dish. 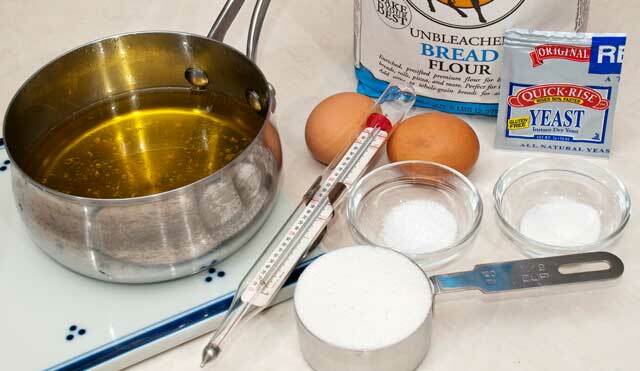 Beat together the softened cream cheese, unsalted butter, confectioner' sugar, vanilla extract and salt. Spread over the rolls while they are still warm. SAVOR!!! These buns also can be made without the hardboiled egg. Enjoy all year long. Looks yummy! I found you thru BB of Oz. 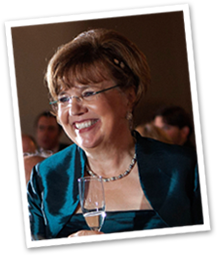 I am always looking for recipes.